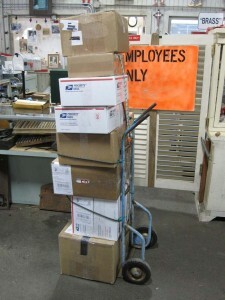 Ali ships 10 - 15 boxes of reused goods sold on Ebay everyday! Got packaging peanuts? Bubble wrap? We want them! We can also use all sorts of other packaging materials. Preferably clean so that we can reuse it! Our Ebay store is doing well and we’d like to keep the spirit of reuse alive by using shipping material that is not made from virgin resources. Please no styrofoam. Thanks!